2015 has started ominously. Just after Italy announced that it would phase out the Mare Nostrum operation, its navy had to rescue two large cargo ships laden with hundreds of refugees, abandoned by their crews on the high seas. A dangerous escalation in the way people smugglers operate in the Mediterranean is underway, calling for new responses from the European Union. On a different front, terrorist attacks in Paris, then foiled plots in Brussels, have sharpened political controversies on immigration in Europe. While crimes committed in Europe by European citizens born in Europe have no link to migration, politicians were quick to stray onto the slippery anti-immigration slope. At the same time, the demographic and economic, but also the social and cultural reasons for which Europe must remain open to immigration are unchanged. From last November till the end of January, the MPC was fortunate to benefit from the presence of Peter Bosch, a senior official of the European Commission with a high reputation among the global migration studies community. 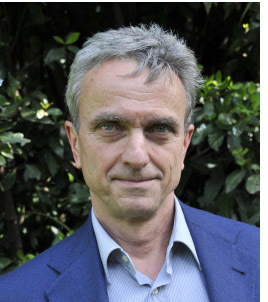 Coming to the MPC as EUI Visiting Fellow, Peter Bosch actively participated in MPC reflections on a pro-active labour migration policy for the EU. Migration policies will be at the heart of the policy agenda of the Juncker-Commission, which started its work last November. The appointment of a Commissioner for Migration is recognition of the importance of the challenging issues ahead. Defining a policy on labour migration will be central for the EU’s future. The EU, indeed, will need to square the circle of attracting skills and talents from abroad, while dealing with serious unemployment - especially among the young - slow economic recovery and increasingly xenophobic and nationalistic tendencies in a number of Member States. Dealing with the many who try to reach Europe by crossing the Mediterranean, responding to the approximately half a million people who come to Europe to seek protection annually and developing ways to better integrate those who join their family members in the EU are issues that affect all European citizens. The European University Institute will certainly play a role in defining the best way forward. Its President, Joseph Weiler, is determined to bring the best of his institute to assist politicians and policy makers to make the right choices, providing facts and figures and showing the complexity of these issues for our rapidly changing societies. During my Fellowship I had my office at the Migration Policy Centre and I was fortunate to meet with many of its researchers. I was impressed by their energy and their commitment. A lot of the research done at the MPC is of direct relevance for the EU’s agenda. Understanding the (migration) realities of the countries in our neighbourhood and in the wider Arab world is important for the policy agenda, as defined by the High Representative of the European Union for Foreign Affairs and Security Policy, Federica Mogherini. The work done on the legislative efforts on migration, labour migration, return issues, integration, the Syria refugee crisis, resettlement and relations with other third countries like India are of great value and support policy development. I would like to thank all of the MPC team members and especially its Director, Philippe Fargues, for their hospitality and their impressive academic insights and research findings. It was an honour and a pleasure to be with you. The ‘CONTENTION’ (CONtrol of DeTENTION) project’s final conference took place at the Fondation Universitaire in Brussels, 12 December 2014. . Those present discussed results and their implications. The conference programme can be found here. Before the final conference, questionnaires, written by the national experts in collaboration with the national judges, were uploaded to the CONTENTION website. Those questionnaires are available here. The project’s synthesis report was also uploaded and is available here. The conference attracted more than 80 practitioners, academics, officials from the EU institutions and representatives from NGOs. The complete debrief of the final conference can be found here. 11 December 2014, national judges and experts and the coordination team gathered for the kick off meeting for the ‘REDIAL’ (REturn DIALogue) project. The REDIAL project will build upon the foundations provided by the ‘CONTENTION’ project, but it will go beyond the contemplation of judicial control of pre-removal detention and will explore the implementation of the Return Directive in every Member State in which it is enforced. The CONTENTION project is co-funded by the European Union under the European Return Fund. CONTENTION partners: the ODYSSEUS Network – ULB and the Centre for Judicial Cooperation. Recent research in migration studies has shown how important it is to consider multiple actors both at origin and destination when we study migrant integration. The INTERACT survey provides a new tool to research migrant integration. Its novelty lies in its cross-national approach in studying civil society organisations at both destination and origin, as actors that take part in migrant integration in EU destination countries. The survey gathered over 900 responses from diverse types of organisations working predominantly in integration matters in employment, education, language and social relations. Their voices give us a better understanding of how they support migrants in migrants’ efforts to integrate in the EU. The exploratory character of the survey does not allow generalisations for all civil society organisations. It does, however, shed light on how these actors’ activities impact migrant integration between origin and destination, and how organisations perceive states of origin and their policies in the day-to-day reality of migrant incorporation in the receiving society. Please consult our website http://interact-project.eu/publications/ to find corridor reports for new light on the role of countries of origin in the integration of selected migrant groups in Belgium, France, Germany, Italy, the Netherlands, Poland, Spain, Sweden, the UK, and the US. The INTERACT project results will also be presented at the INTERACT Final Conference, which will take place in Brussels, 27 February 2015. The conference will discuss the transnational bonds between the countries of origin and destination and will look at how these bonds affect integration in Europe, based on the INTERACT project findings. It will gather participants from academia, from civil society and from public administrations. The INTERACT project is co-financed by the European Union. By January, GLMM had collected, analysed and published more than 450 tables and more than 380 legal documents for Bahrain, Kuwait, Qatar, and Saudi Arabia. On a weekly basis new data and documents are published, especially for Oman and the UAE until they reach the same level of completeness as the other four countries: http://gulfmigration.eu/glmm-database/. The user-friendly GLMM website allows for the downloading, in pdf and Excel, of all information contained in the demographic-economic and in the legal databases, which can be retrieved through a variety of search options. A number of papers were recently published, with more to come by the end of January: http://gulfmigration.eu/publications/. GLMM organised a panel on “Arab Gulf Labour Markets and Migration: Challenges, Data, Policies” at the 48th Annual Meeting of the Middle East Studies Association of North America (MESA) - Washington, D.C., 22-25 November 2014 with four original research papers. For more information, please click here. GLMM is organizing a panel on “Irregular Migration to the Gulf: The role of legislation, policies and practices” at the 6th Annual Gulf Research Meeting (GRM) – Cambridge, 24-27 August 2015. For the call for papers, please click here. At present, GLMM is developing a number of regional comparative research projects – including fertility and irregular migration, as well as training and data analysis activities. For full information about the project: http://gulfmigration.eu/. The GLMM programme is conducted together with the Gulf Research Centre (GRC) and is financed by the Open Society Foundations (OSF). Demo India has recently launched a new area of comparative research that will see a group of ten plus external experts write papers, analysing the media treatment of the Indian community across the EU. External experts will carry out a detailed content analysis of the media in their countries on themes as diverse as business links, the educational performance of children of Indian origin, and labour market integration. Other issues that will be addressed include linguistic and cultural integration, crime reporting, and religion and controversies over religious symbols. This media analysis will present a unique opportunity to compare the media’s treatment of Indian immigrants and their native-born children across the EU, in a social climate in which immigration remains politically sensitive. This research will, furthermore, enable the Demo-India team to discern key similarities and differences in media portrayals, not only cross-nationally, but also with respect to other immigrant and minority groups. Since a key aspect of integration also concerns the social integration of new citizens, media portrayals can serve as an important ´litmus test´ of social integration with regards to the Indian community in Europe. The Demo-India project is conducted together with the Indian Centre for Migration and co-financed by the European Union. Terrorist attacks in Paris and migration: are they linked? The MISMES Project (Migrant Support Measures from a Skills and Employment Perspective), implemented by the MPC jointly with the European Training Foundation, is now approaching its end. After the final technical workshop held in September in Torino (see MPC Newsletter of October 2014), the five country case studies on Moldova, Georgia, Armenia, Morocco and Tunisia will be finalized. Evidence collected for those studies highlights some interesting differences in the profile of migrant support measures implemented in those countries, as highlighted in the policy brief on MISMES and EU Mobility Partnerships, drafted on the basis of those studies. Migrant support measures in Eastern Partnership countries (Moldova, Georgia and Armenia) tend to concentrate on assisting migrants upon their return or in integrated projects combining pre-departure, during migration and after return assistance (so-called multidimensional MISMES). In Morocco and Tunisia, meanwhile, MISMES tend to focus on the pre-departure phase, and in particular in international job matching. Morocco is unique in the relative number of MISMES focused on skills development and migrant skills capitalization. In terms of actors implementing MISMES, national governments are the main actor in this field in Moldova and Morocco: in the case of Moldova, this has evolved from a situation where MISMES was undertaken by international organizations a few years ago, leading to increased ownership by national authorities, possibly as a consequence of the implementation of the Mobility Partnership since 2008. In Georgia and Tunisia, international organizations still prevail (though in Tunisia they usually cooperate closely with national agencies), whereas in Armenia national and international civil society organizations play a very prominent role. The ETEM project, led by the International Organization for Migration (IOM) in partnership with the MPC, conducted the two activities below. This roundtable was organised by the European Commission in Brussels, 1 December 2014. The roundtable served as a consultative process with EU Member States and third countries on the issue of refugees, internally displaced persons (IDPs) and innovative development approaches to forced displacement. Its objective was to inform ongoing policy reflections on the topics covered within the European Commission’s DG for Development and Cooperation (DEVCO) and the DG Humanitarian Aid and Civil Protection (ECHO). The International Organization for Migration, with the assistance of the Migration Policy Center, organized a workshop in Addis Ababa, 10-12 December 2014: this was done in the framework of the External Thematic Expertise on Migration (ETEM) that both organizations provide for the European Commission (DG DEVCO). The workshop brought together EU Delegation officers in charge of migration issues from Ethiopia, Eritrea, Sudan, Kenya, Djibouti and Zimbabwe, as well as from DG Home, the European External Action Service and DG DEVCO in Brussels, to discuss EU external cooperation on migration and asylum in the region. 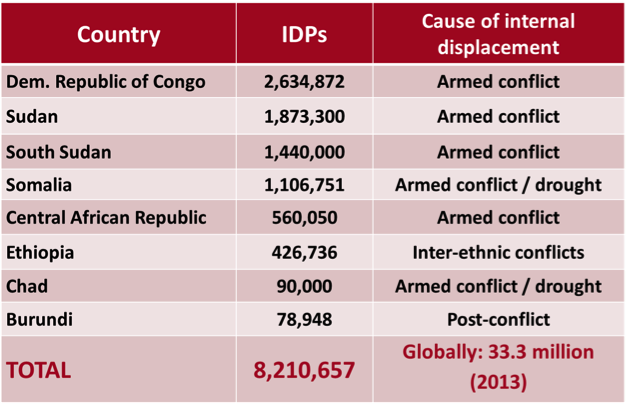 Whereas migration from the region is rather marginal, at least in global terms, East Africa has a very significant weight in the global flows of refugees and internally displaced persons, second only, in fact, to the Middle East (see Figure 1). As far as the EU is concerned, the number of new asylum applications to EU Member States, although still limited (slightly above 60,000 for the whole region in 2014), has registered a steep increase over the last four years (from 36,000 in 2011), specially for Eritrea, which became the second country of origin for asylum seekers in the EU after Syria. Therefore, phenomena closely linked to refugee flows, such as the trafficking and smuggling of human beings, were discussed in depth, including the unique African Union Convention on the Protection and Assistance of Internally Displaced Persons (Kampala Convention), which is without parallel. However, the workshop also devoted a lot of attention to migration and development issues and how to develop policies to efficiently manage labour migration and to facilitate the free movement of persons within the region through regional integration processes such as the 2010 Common Market Protocol of the East African Community: this Protocol is progressing towards a harmonized work permit and the mutual recognition of professional and academic qualifications among Member States. There is also the 2005 Protocol on Facilitation of the Free Movement of Persons of the Southern Africa Development Community, which has not yet been ratified. Finally, participants discussed the involvement of EU Delegations in the region in the development and implementation of the Khartoum Process (EU-Horn of Africa Migration Route Initiative), an inter-regional migration policy dialogue launched in the Ministerial Conference, held a few days before, 28 November, in Rome. The ETEM Project is financed by the European Union. Two years ago, in January 2013, MPC collaborated with a team of journalists to create the Syrianrefugees.eu website, a resource that monitors the EU’s response to the crisis and highlights the human stories of those who have taken refuge in neighbouring countries and Europe. In autumn 2014 this site was substantially improved. Video interviews on the crisis and updated statistics on Syrian asylum seekers to Europe and humanitarian aid dollars were added. And two new sections of rich, multimedia content, covering those refugees who have sought protection in Sweden and Bulgaria, have also been loaded up to the site.